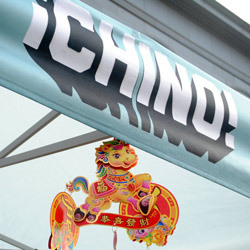 There’s a new kid at the Ferry Plaza Farmers Market, and he goes by Chino. The brainchild of Tacolicious owner Joe Hargrave and former Bar Agricole chef Brandon Jew, the restaurant soft-launched last December at the Saturday market, offering a fresh and from-scratch spin on a classic cuisine. He spent a year cooking in Shanghai, where he was “opened up to real Chinese food,” then came back to San Francisco. At Bar Agricole, he was able to experiment with combining Chinese and Northern California cuisines, making his own sausages and fermented bean paste. Joe and Brandon eventually connected about their shared restaurant concept, and things clicked. When Andalu in the Mission District closed its doors last year and the space became available, the timing seemed right. Joe approached CUESA to host a pop-up restaurant at the Ferry Plaza Farmers Market, where Chino could start testing their menu items while the brick-and-mortar was being modeled (it’s currently set to open mid-April). “I really appreciate the way we got to incubate the Tacolicious concept at the Ferry Plaza,” says Joe. While there is a large community of Hmong farmers growing Asian vegetables in the Central Valley, Brandon says that many items, like Chinese celery, Chinese chives, and chayote greens, are hard to find organically grown. At the Ferry Plaza, he is heartened to see more organic farmers growing vegetables like tatsoi and bok choy. Chino’s menu highlights clean and bright flavors as well as local and organic farms. 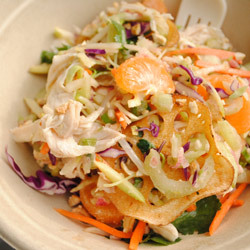 A sweet and crisp chicken salad features carrots, cabbage, kohlrabi, and Hamada Farms mandarins. Pickled cucumber salad takes on a Latin flair with avocados from Brokaw’s Nursery. 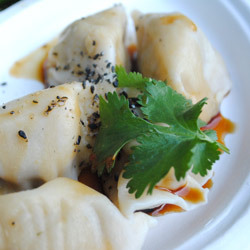 Wontons and dumplings are made with organic flour from Central Milling. Update February 4, 2014: Tacolicious and Brandon Jew have amicably parted ways so that Brandon can focus on his own restaurant project, but Chino will continue to be lead by the Tacolicious team. Read more at tablehopper. Try Chino for yourself at the Ferry Plaza Farmers Market on Saturdays and Thursdays.